In the ancient Persian religion of Zoroastrianism, souls after death first cross a bridge and meet a young woman who represents the personification of their actions in life. If the dead person has led a good life, she looks beautiful, while to the sinner she is hideous. It doesn’t get better for them, either: sinners are then thrown into the House of Lies, in which the damned continuously eat ‘foul food.’ This includes corpses, rotten food and several rather unpalatable bodily fluids. It’s also dark, smelly, and no matter how crowded it is, its inhabitants think they’re all alone. To reach this underworld from Babylonian mythology, the dead first pass through seven gates, bribing the gatekeeper at each one with a piece of their clothing or jewelry. Why exactly they’re so eager to get there is a bit of a puzzle, since the inside is a dark, gloomy expanse where everyone is forced to eat and drink only dust, and there’s not much else to do. Also, everyone there wears feathers for some reason. The most depressing thing about this Babylonian hell, though, was that it wasn’t actually punishment for major wrongdoing – with the exception of a few heroes, everyone went there. This was the final destination for Vikings who had the misfortune not to die a glorious death. Unlike most modern versions of Hell, Helheim was very cold. The entrance was guarded by a four-eyed, blood-soaked hound called Garmr, and by some accounts the whole place was watched over by a giant eagle called ‘corpse-eater’ whose wings created the icy wind. As if that wasn’t bad enough, Vikings whose deeds were especially bad went to an area under Helheim called Niflhel, which was even darker and colder. If you’re a follower of Pure Land Buddhism, this is the worst type of hell you can end up in. It’s so bad that you can only get there by committing one of the five ‘grave sins’: basically, you must kill an extremely holy person, a Buddha, or your own parents. Although Avici is technically not eternal, it does last trillions of years, which must seem like even longer when you’re facing its unending punishments. It’s surrounded by iron walls, and also features iron snakes, and iron dogs that breathe fire. Inhabitants of this hell can actually die there, but are reborn into the same hell, which must be a bit of a disappointment. According to the Hindu scriptures, this hell is divided into at least twenty-five realms according to the sinful deeds that brought people there. To get an idea of what goes on in each of these places, one of these hellish realms is called ‘Diarrhea,’ and another is called ‘Forest of Sword Blades’. In some versions of Hindu hell, sufferers are actually somehow compelled to perform their own punishments, such as climbing up and down spiny trees that tear them to pieces. 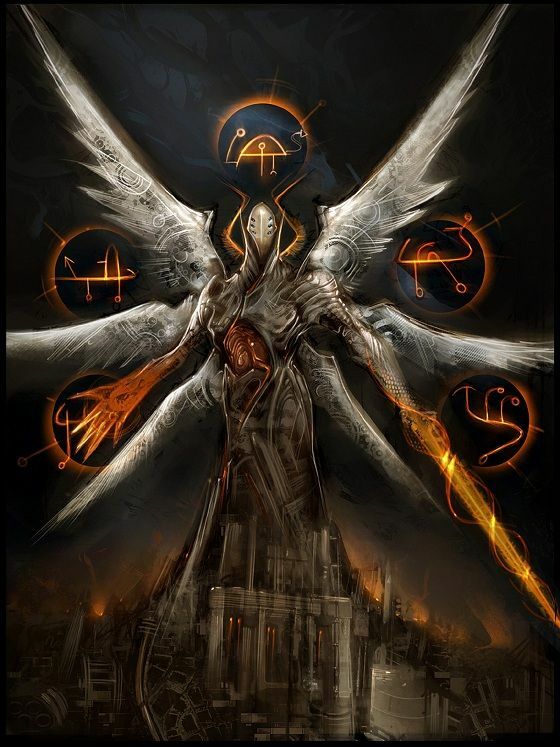 In Mongolian shamanism, departed souls are judged before Erkil Khan, the prince of the underworld. If their bad deeds are more numerous than their good ones, they’re sent to a hell known as Kasyrgan, where they are boiled in black tar inside a giant cauldron. The worst sinners are stuck there forever, but a person who had done at least some good in life might gradually rise towards the surface of the tar, until the crown of his head reaches the surface. People in heaven who benefited from his good deeds in life can then send a special spirit to grasp the sinner by the hair, and pull him up towards paradise. In Tibetan Buddhism, ‘Black Thread Hell’ is reserved for slanderers, liars and people who mistreat their parents. Sinners are marked with black lines, and then cut up along these lines with burning saws. But if you sinned in a different way, don’t worry! Emanuel Swedenborg, a Swedish philosopher born in 1688, had a series of visions from the age of 53 in which he ‘visited’ Heaven and Hell. His vision of the Christian hell was unique: according to Swedenborg, it looks like a filthy, rundown city. The damned can leave at anytime, but do not want to. Their suffering is based not on external punishment, but on the fact that they’re full of cruel desires. Churches based on Swedenborg’s vision and philosophy exist to this day. After death, Aztecs en route to this underworld went on an epic four-year journey, facing deadly mountains that tried to crush them, demons, and icy winds that cut them like knives. 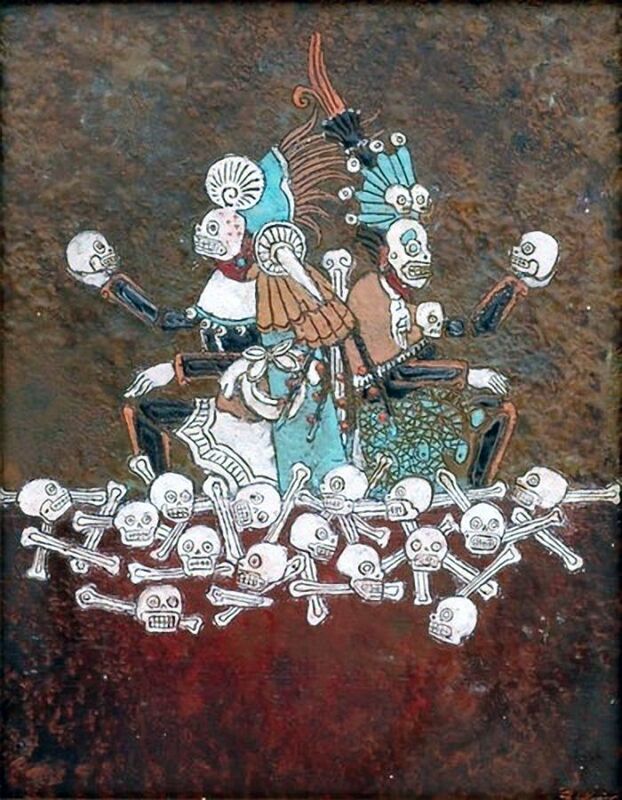 Again, it’s hard to tell why they tried so hard, because the place they eventually reached was a gloomy realm ruled by the god Mictlantecuhtli, a blood-splattered skeleton who wore a necklace of human eyeballs. His cheery home was surrounded by bats, spiders and owls. Worse, Mictlan was a bit like Helheim and Irkalla, in that you didn’t even have to be evil to go here. Warriors and women who died in childbirth went to an Aztec version of paradise, as did those who died by drowning or hanging. In other words, if you were an Aztec concerned about your afterlife, it probably wasn’t wise to learn how to swim. According to the ancient Greeks, Tartarus was as far below the ‘normal’ Greek underworld, Hades, as heaven was from Earth. In Tartarus, people who had committed especially awful sins were given suitable punishment. 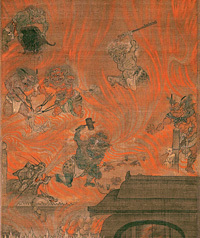 A famous example is Tantalus, who when he was alive killed his own son and served him to the gods, among other crimes. As punishment, he was forced to sit next to appetizing food and water that he was unable to eat or drink. This hell was not eternal for everyone: by one account, people whose sins were bad but not that bad were punished for a year, and then washed out of Tartarus in one of the great rivers that ran through it. They’d end up in the Akheronian Lake, whose shores reached other, less hellish parts of the underworld, and from its waters beg the people they had harmed in their lives to allow them to leave. If their victims agreed, the sinners joined them on the shore; otherwise they were swept back in to Tartarus, and the situation repeated until their victims finally relented and let them out. Kind of like a parole hearing. First! …wait this isn’t meme base! No Dante`s Inferno? Where Satan is frozen in ice and he`s munching on Judas, Cassius and Brutus? On the old black and white film, he looks like Saddam Hussein! Still, my personal favourite bit of Dante`s Inferno, is the bit where the Prophet Muhammad, or “The Sower of Dicord,” as Dante calls him, is ripping his chest open and showing his entrails! But seriously, it’s an interesting list. 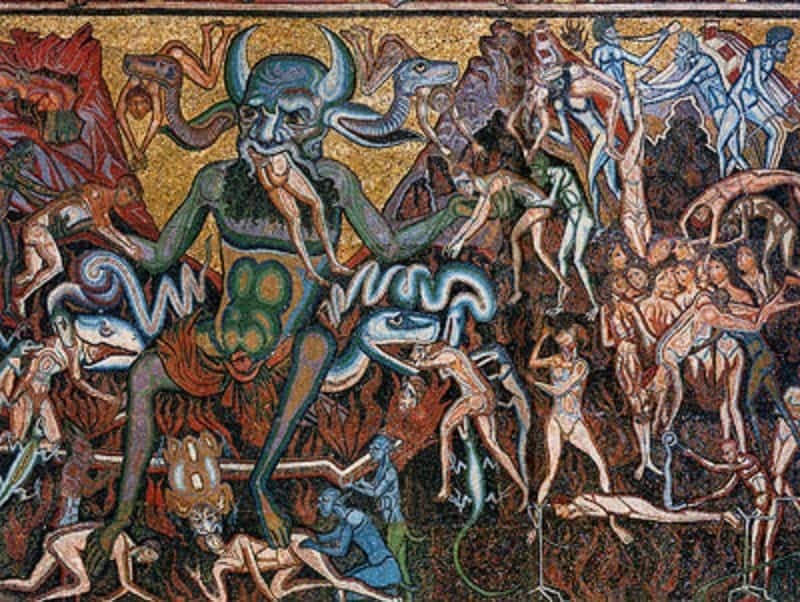 Swedenborg’s version of Hell reminds me of C.S. Lewis’ Hell in “The Great Divorce,” a lonely, gray city in which the inhabitants get to take a bus trip to the outskirts of Heaven, but always return back to Hell, where they follow nothing but their own selfish desires.